We haven't been posting as much sneaker inspired art lately just because there really hasn't been anything that has grabbed our attention enough and really moved the needle when it comes to originality. However today we are happy to shine a little light on Marci Kenczler who created this amazing illustration titled "Air Force 1 Vibe". 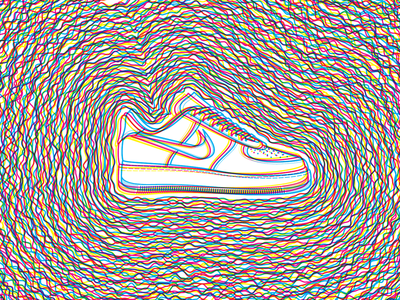 This trippy simplistic image of the classic Air Force 1 is done up with a great 3d look to it which really makes it stand out from the crowd. Make sure to go follow his Tumblr directly here to stay up on his work.